without construction down-time and costs. allow designers resolve space management challenges found in their healthcare projects. FlexePort booms are a model of flexibility and functionality. Thanks to the versatile iBox equipment manager, FlexePort booms can be easily configured for operating rooms (OR's), intensive care units (ICU's) and other critical care areas, thus making them the most flexible boom for all clinical applications. The acceptance of so-called prefab environments in the design of special care areas, such as the OR and Critical Care, has grown to the point that this has become a standard approach for many countries. The FlexeSpace prefabricated modular system is designed purposely for the construction of healthcare interiors, surpassing current infection-control requirements. 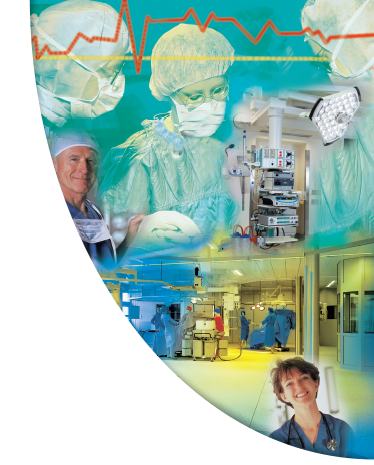 The innovative FlexeLux 16 and 12 set a new benchmark for major surgery lights. Their characteristic design is a fine example of form meeting function for the betterment of the OR environment. Medicana has been very active in the industry, both in Canada and in the United States, with over 4000 Patient Rooms and OR's sold both directly and as an OEM Supplier. Medicana's experienced team is the backbone to the Company's reputation in quality, service and customer care. In manufacturing, installation, service and even in the development of custom solutions for clinical needs, Medicana's team has the skills to get the job done. With years of experience, they have a proven track record in the delivery of quality products for healthcare projects of all sizes and scopes. Join the Medicana team and grow your business with existing customers. Medicana was an integral element to the success of this world-class project. It presented a unique fusion of experience, innovative design and technology to the hospital's ICU design team. The company's team members provided substantial, thought-provoking contributions from design to commissioning. Ultimately, the synthesis of expertise between hospital planners, architects and Medicana led to this great success. Sign up with your name and email, we'll send you our partner options. Copyright © 2016 Medicana. All right reserved. Established in 1963 in Montreal, Canada. Corporate focus ranges from entire turn-key construction solutions utilizing FlexeSpace Prefabricated Modular Systems for operating rooms and critical care areas to the design, manufacture and installation of the capital equipment required to complete the project. Innovative design is the key to the Companies leadership in the industry. Medicana has vast experience in architectural applications for ICU's, OR's as well as Specialty Therapy Rooms, Trauma Units, and Emergency.